These are all the horses who won the Preakness Stakes since the race was first held in 1876 and paid the most to win. The Preakness is the second leg of thoroughbred horse racing's Triple Crown. The first leg of the Triple Crown is the Kentucky Derby which is run the first Saturday in May, followed by the Preakness Stakes two weeks later, and then the Belmont Stakes comes three weeks after the Preakness. These are the 10 highest paying winners of the Preakness Stakes, the second leg of the Triple Crown. Historically, the Preakness draws far fewer runners than the Kentucky Derby does. 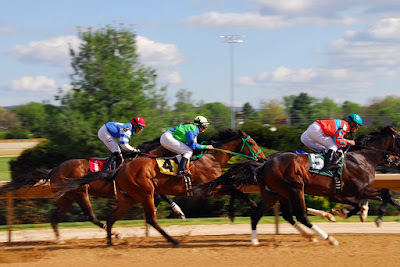 It is the least prestigious of the three Triple Crown races, and it is held at Pimlico Race Track in Maryland. All three of those factors combined have led to the Preakness having far fewer long-shot winners that paid a lot of money to their backers than either the Kentucky Derby or the Belmont Stakes have over the years. In general, the fewer horses in a race the less likely you are to have a long-shot winner who pays a lot. The winner of the Preakness Stakes that has paid the most money to date to win was Master Derby who went off at odds of 23.40 to 1, and paid $48.80 in 1975. The second highest paying winner of the Preakness was Coventry, who went off at odds of 21.80 to 1, and paid $47.60 to win in 1925. One year after Coventry won at big odds, Display lit up the tote board at odds of 19.35 to 1 in 1926. He paid $40.70 to win, the third highest paying winner of the Preakness. In 1972, Maryland bred Bee Bee Bee took advantage of a sloppy track at Pimlico to win the Preakness at odds of 18.70 to 1. Bee Bee Bee paid $39.40 to win as he beat two great racehorses in Riva Ridge and Key to the Mint. Riva Ridge won both the Kentucky Derby and the Belmont in 1972, but did not run well over the sloppy track during the Preakness. Effendi went off at odds of 15 to 1 and won the Preakness paying $32.00 to win in 1909. Don Enrique also went off at odds of 15 to 1 and paid $32.00 to win in the 1907 Preakness. Hindus also paid $32.00 when he won the Preakness in 1900. The Maryland bred and Billy Boniface trained Deputed Testamony won the Preakness in 1983 and paid $31.00 to win to his backers.